As shown above, annual nominal GDP growth has bottomed out near 3% on a year-on-year basis, while the two-quarter annualised growth rate has returned to the 4% average for this cycle in the third quarter. The action of the automatic stabilisers (for example, taxes and unemployment insurance) is to stabilise nominal incomes, hence it is not surprising that nominal growth rates are fairly steady during the growth phase of the cycle. The breakdown of nominal GDP between real growth and inflation is somewhat erratic, and so the movements in real GDP can be more volatile. 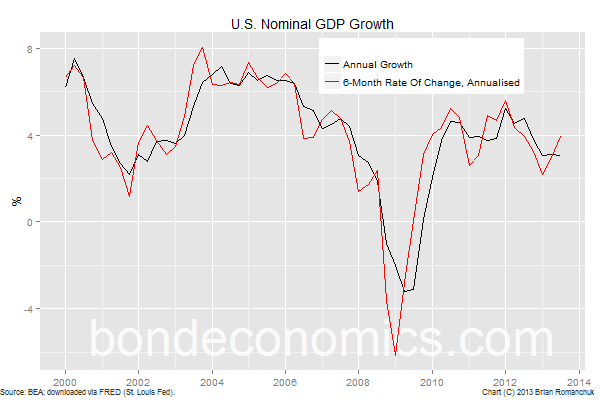 The focus on the quarterly real GDP numbers probably creates a lot of unnecessary drama. The labour market is currently the most important market within the U.S. economy, and as far as I can tell, it remains consistent with the "muddle through" scenario. The Job Openings and Labor Turnover (JOLTS) survey was released Friday, and the data roughly followed previous trends. As I discuss at greater length in "U.S. Jobless Claims: No New Information", the downward march of the weekly jobless claims is explained mainly by the change in mix of how people exit employment: currently, a higher percentage of people voluntarily leave their jobs than was the case a few years ago (second panel of the chart). Since these people do not qualify for unemployment insurance, the number of new claims drops. However, this just changes how the job separations occur, but does not imply faster net job growth (bottom panel). The Pending Home Sales Index (from the National Association of Realtors) was released earlier today. The index fell by 0.6% in October, and fell by 1.6% year-on-year (data release link). However, the government shutdown was blamed for some of the weakness (income verification data is supplied by the IRS, and there were processing backlogs because of the shutdown). In any event, it appears that the housing market recovery is slowing, which reduces the odds that growth rates will accelerate from current levels. Finally, in the post "Larry Summers and the bubbles", Merijn Knibbe examines a point raised by Larry Summers - why did core inflation not rise during the tech and housing bubbles? (Note: Overall inflation ("headline" inflation) generally was stronger during the expansion as the result of oil prices rising at the same time as the U.S. economic expansion. However, the oil market is global and headline inflation could decouple from domestic developments. This is why we want to look at inflation ex-energy prices.) Merijn notes that the GDP deflator excluding food and energy did show more cyclical variation during the bubble periods. This means the ex-food and energy GDP deflator could be an interesting variable to monitor. However, I believe that there are problems with the "core" GDP deflator as an inflation measure. Firstly, the GDP numbers are revised extensively, so the data may only be useful for historical analysis. And secondly, there are strange effects due to how imports enter GDP. Imports subtract from GDP, and so quantities involving imports enter equations with a negative sign. This creates non-intuitive effects, such as rising oil import prices lowering the GDP deflator. At some point, I may return to this topic and look at it in more depth.